LITTLE ROCK – Of all the hazards a tree lover in Arkansas must endure, the occasional wasp gall or fungal infection among the leaves of his or her favorite oak tree might be the least worrisome. Which isn’t to say they aren’t a little unpleasant to look at. Jon Barry, extension forester for the University of Arkansas System Division of Agriculture, said that two seasonal syndromes common to oak trees in the Arkansas summer, jumping oak gall and oak anthracnose, have begun to rear their heads in certain areas of the state. The first, jumping oak gall, is caused by Neuroterus saltatorius, one of about 250 species of gall wasps found on oak, he said. The gall — typically a series of small, scab-like cysts that cover the leaves — serves as an incubator for the tiny, stingerless gall wasp larvae, which are deposited in the early spring. Barry said that many times, an accumulation of galls will cause leaves to prematurely brown, but the syndrome is seldom aggressive enough to harm the tree itself. Jumping oak gall is so named because as the larvae matures inside the gall, their active movements can cause a fallen gall to actually move or “jump,” not unlike the phenomenon of “Mexican jumping beans,” Barry said. Barry said there is no broadly-recommended treatment for jumping oak gall. 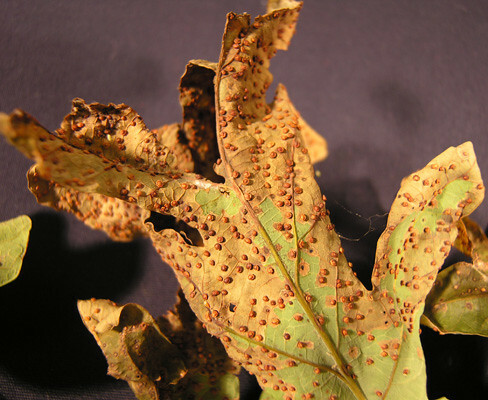 The other syndrome currently making an appearance in oak trees in the state is oak anthracnose, a fungal infection that thrives during cool, wet springs such as the one much of Arkansas has enjoyed the past few months. One of the primary recommendations for controlling oak anthracnose is to gather fallen leaves and twigs in the fall and burn them, Barry said. The fungus overwinters in the leaf litter, and spores later splashes up onto the live leaves of low-hanging branches during the rains of the following spring. Sherrie Smith, Arkansas state plant disease diagnostician and plant pathologist for the Division of Agriculture’s Cooperative Extension Service, said her office has begun to receive reports of the two syndromes in various areas of the state, including Benton, Washington and Pulaski counties. Chandler Barton, Forest Health Specialist with the Arkansas Forestry Commission, said the gall wasp, which is a native insect, can periodically increase to outbreak levels when conditions are right and its abundance will likely subside in following years. Smith routinely receives diseased plant samples from Cooperative Extension Service agents from counties throughout the state. When she diagnoses a diseased plant, the report she generates goes both to the submitting agent and to the state’s plant disease database, which helps track and record incidences throughout Arkansas. Barton has been scouting several northwestern Arkansas counties to confirm sightings of jumping oak gall and oak anthracnose. “Most of the calls I’ve received have been from folks who have seen it from the highway,” he said. “The bulk of the severely affected area is near the Bobby Hopper Tunnel on I-49 and eastward. I can’t say for certain how far east into the Ozarks the issue can be found, but I believe that I was able to map the worst of it. Barton said white oaks, specifically the Quercus alba species, in the area appeared affected by jumping oak gall and oak anthracnose at various degrees on the same trees. In terms of the spread, Barton said the worst appears to be over. Barton said his official report, along with maps and images, should be available to the public soon. To learn about plant pathology and diagnosis, contact your local Cooperative Extension Service agent or visit www.uaex.edu.